Margaret Keliher is a practicing lawyer. She is the former Dallas County Judge, charged with overseeing the Dallas County Commissioners Court, and the former Judge of the 44th Civil District Court. 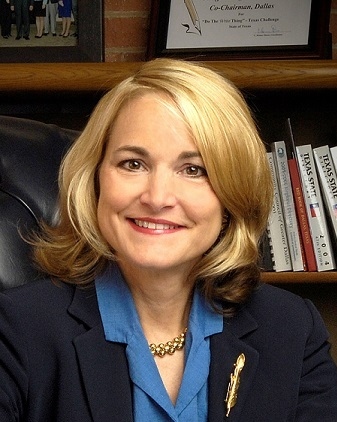 After her term as Dallas County Judge, she was with the law firm of Locke Lord before being asked to become the Executive Director of Texas Business for Clean Air. Prior to becoming a Judge, Margaret practiced law with Jones Day and was a felony prosecutor in the Dallas District Attorney’s office. Prior to attending law school, Margaret was a CPA with Deloitte. Margaret holds a JD from SMU’s Dedman School of Law and a BS in accounting from the University of Virginia. Margaret is married to Lester Keliher and proud mother of three children: Margaret, Joseph, and Alex. Margaret believes in giving back to the community. She currently serves or has served, on numerous boards. Margaret is a member of the following professional associations: Texas Bar, Dallas Bar Association, American Law Institute, and Texas Society of CPAs. Margaret is a Past President of Executive Women of Dallas, International Women’s Forum-Dallas, and Charter 100. She is the first, and only, female to serve as Dallas County Judge in the history of Dallas County. She is the recipient of the Vision of Hope Award, and the recipient of various awards in connection with her work for Clean Air throughout the North Texas region. She is also the recipient of the Rosewood Award.